Compared to many of the soups I learned in Paris, it’s also a reasonably fast, easy and inexpensive recipe perfect for making at home. Few foods have the versatility of soups. They run the gamut from vegan to meat-laden, healthful to comfort food-rich. Some are complex and planned, others a fridge-cleaning-out hodgepodge of improvisation. Everything I know about soup I learned while cooking in Paris, working under an old-school chef from Normandy who had spent a two-year apprenticeship doing nothing but preparing soups. He taught me about consommés and veloutes, thick porridges and light airy broths, stews and provincial porridges of vegetables and herbs. A master at extracting the maximum flavors from each ingredient, he passed his craft on to me. I'd like to think the soups we make at my Jewish deli, Kenny & Zuke's, honor his legacy. And of those soups, there's no question about the most popular. 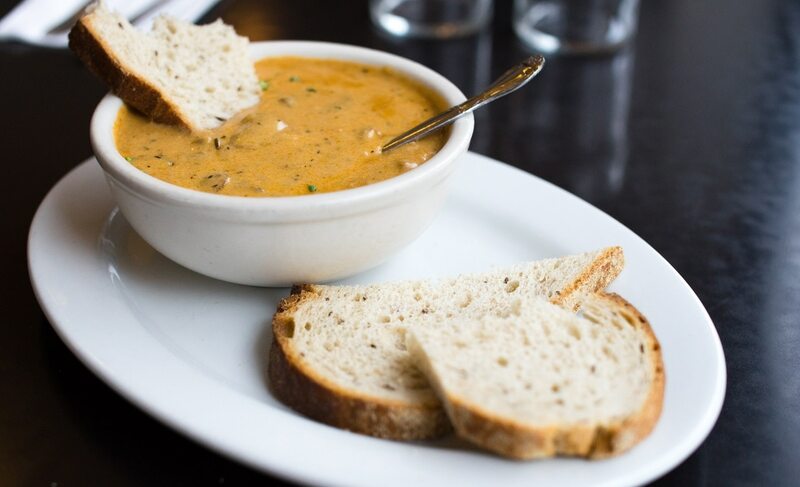 Our Hungarian mushroom soup has been on the menu since we opened, nearly a decade ago now. It has a loyal following that forbids ever removing it from the menu, even if we wanted to—which we don't. Compared to many of the soups I learned in Paris, it's also a reasonably fast, easy and inexpensive recipe perfect for making at home. Willamette Week asked me to share the recipe. In a large, heavy pot over medium heat, cook diced onions, carrots and celery in unsalted butter, until the vegetables are softened. Stir in garlic and cook for 5 minutes longer, stirring frequently. Season lightly with salt and black pepper, stirring occasionally. Don't allow the vegetables to color. Turn up the heat to medium-high and add mushrooms. Stir frequently until mushrooms are cooked through. Season again. Sprinkle with paprika and dried thyme. (Note: Thyme is one of the few herbs I think are good dried, but if you want to use fresh, use a bit more and add it toward the end.) Stir to mix well. Turn the heat back to medium and sprinkle with flour. Stir well and keep stirring for 4 to 5 minutes while cooking, coating the mixture well and making sure the flour, which has now formed a roux with the butter, doesn't stick to the bottom of the pot and burn. Add 2 quarts of hot water and stir well. Bring to a simmer, stirring frequently, and cook for about 10 minutes or so. Add a cup of heavy cream and bring back to a simmer. Correct the seasoning and serve. Should serve up to a dozen people. Note: There are some customizations you can do to make this a bit finer, such as adding some wild mushrooms into the mix, or a little dry sherry a few minutes before the soup is finished. Feel free. Another note: You'll notice I season often. I don't really add any more salt than I would if I just seasoned all at once, but seasoning each element of a dish as you go along gives more layers to the flavor of your food. Ken Gordon is the owner and chef at Kenny & Zuke's Delicatessen, 1038 SW Stark St., 503-222-3354, and Bagelworks, 2376 NW Thurman St., 503-954-1737, kennyandzukes.com. Why Are Tokyo Ramen Shops Suddenly Taking Over Portland?